The BlackBerry Q5 is the poor man’s version of the BlackBerry Q10. First launched in developing markets, the Q5 is now available in Canada for the budget conscious. But I’m asking: is the extra cash in your pocket worth the performance hit? In many ways, using the Q5 is just as good an experience as using the Q10. The screen is the same size and it looks really sharp. Despite the slower processor, I found it snappy and responsive. Running side by side the Q10, you can’t really notice any difference. I found the keyboard pretty comfortable to type on. It may lack the premium feel of the Q10’s keys. Those are separated by metal frets. But in the end it’s really just as functional. I found myself using it to type up stories on the subway. Battery life is good on the Q5. It will last all day long if you’re not pushing it too much. But you can’t remove the device backing to replace the battery. I know some BlackBerry power users swear by carrying around a second battery. When they run out of juice, they just swap the depleted battery for the charged one. You could do that with the Q10. The plastic body just isn’t up to par with that glass-weave super-material on the Q10. I found it scuffed easily. The Q5 is a bit taller than the Q10 and just a hair thicker. It weighs a little bit less. Another downside is the camera. Not only does it take photos with fewer megapixels, it actually has a smaller lens. 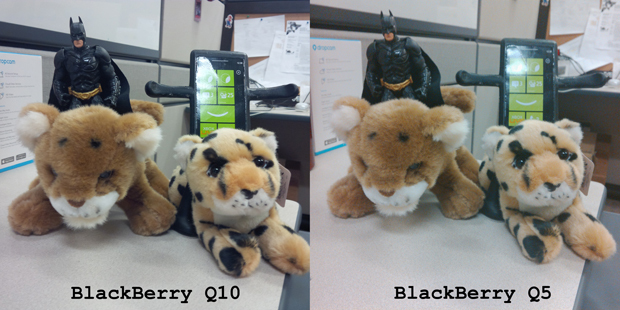 Just look at the difference between these photos of a Batman action figure and Windows Phone Man riding stuffed lions. The Q5 image is washed out and grainy compared to the Q10 photo. One weakness of the BlackBerry 10 platform in general is its lack of apps compared to iOS and Android. I missed the official version of Google Maps and its navigation features. There’s third-party stand-ins and of course the BlackBerry Maps alternative, so you still won’t get completely lost. Consider the Q5 if you really want a BlackBerry and are going to buy it off contract. It retails for about $400 compared to about $650 for the Q10. But if you’re getting a subsidized device anyway, shell out the extra dough for a better device.